Crime Scene Science Fair Projects – Science is Fun! Shows like CSI, Law & Order and NCIS have made forensic science a popular topic among students. These experiments allow you to experience the real science behind the TV shows. Use techniques that real Crime Scene Investigators and Forensic Scientists use in the field! The Science Fair Basics section gives you all the tools you need for a successful science fair project, whether you use a project in the book or not. And while you’re at it find out about careers in forensic science and get tips from the original crime scene investigator – Sherlock Holmes! Blood, gore, and mystery—now, that’s way cool! 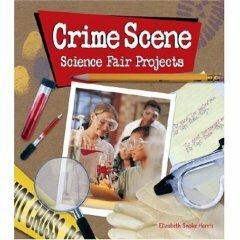 Kids just love crime scene investigations, and they’ll get a thrill from turning their passion into a blue-ribbon science fair project. This fantastic color collection presents more than 20 great experiments, broken into exciting topics such as blood and guts, eyewitness accounts, and physical evidence. Best of all, children use actual CSI techniques: they’ll lift fingerprints, extract DNA, record skid marks, and see what a few key clues can reveal about a crime. Then they get to analyze the data, and come to their own conclusions. And don’t worry: there are no real crime scenes, dead bodies, or even suspects involved! (For example, an old steak demonstrates the process of decomposition.) In addition to the awesome projects, there’s tons of fun CSI history, careers, and cases. Published in 2006 by Lark Books.